Transcribe text into the textarea as closely as possible to the order and format on the memorial, but ensure each name is on a new line. You can save at any time. When all text has been transcribed, please set the Transcription complete field based on whether names are present in the transcribed text. 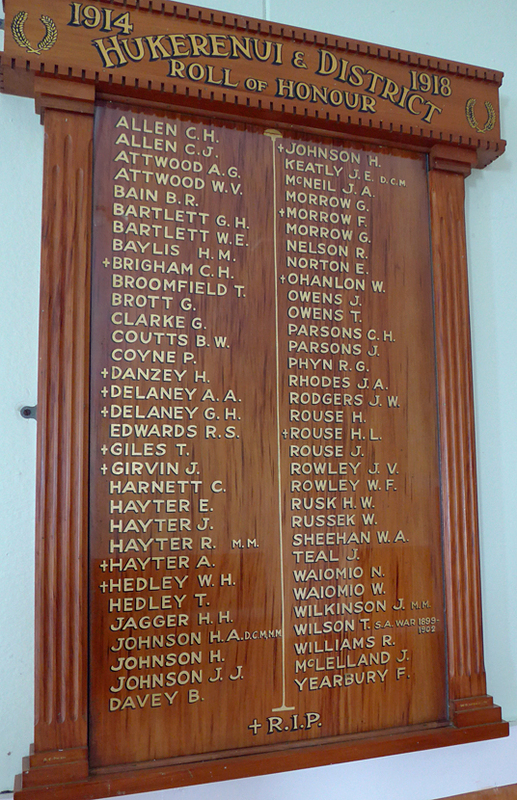 1914-1918 Hukerenui & District Roll of Honour Allen C. H. Allen C. J. Attwood A. G. Attwood W. V. Bain B. R. Bartlett G. H. Bartlett W. E. Baylis H. M. +Brigham C. H. Broomfield T. Brott G, Clarke G. Coutts B. W. Coyne P. +Danzey H. +Delany A. A. Edwards R. S. +Giles T. +Girvin J. Harnett C. Hayter E. Hayter J. Hayter R. M.M. +Hayter A. +Hedley W. H.
hukerenui-hall-2.jpg from Hukerenui Memorial Hall.